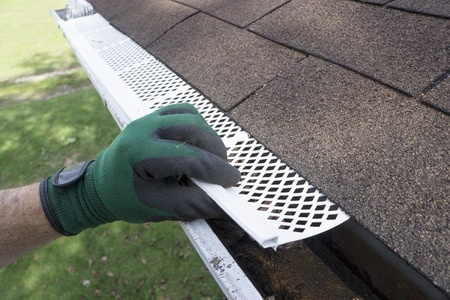 For the best gutter guard installation in Hamilton, OH call Hamilton Gutter Pros today. Do you loathe the springtime and other times of the year when the weather causes gutters to be filled with all types of extraneous matter? Every homeowner knows the feeling, when it's time to clean the gutters, only to have them fill up again with leaves, dirt, residue from the roof, and other matter. No matter how hard you try it's a never-fail situation. You have probably even tried screens and other techniques to save you the trouble, all to no avail. If this describes you, you are in for good news. Hamilton Gutter Pros has the solution. For all of your gutters, you should have gutter guards installed. What are gutter guards? Quite simply, gutter guards are covers that keep things like leaves and other assorted junk from getting into your gutters. No longer will you have to worry that after each rain or windstorm you will need to inspect the gutters to see whether you need to clean them out or not. After all, gutters can only take so much weight, and things like leaves and dirt take up a considerable amount of the weight that gutters can hold. Making this situation even better, gutter guards installed by Hamilton Gutter Pros are the best since we know not only how to install gutters better than anyone, but we also install the guards that go with those gutters. Better yet, we have more experience installing gutters and gutter guards than anyone else, which means that with Hamilton Gutters, you will be getting the best possible service and parts available. Hamilton Gutters have been in the gutter business for several years, serving customers in the Hamilton and West Chester area more than anyone else. That's part of the reason why we don't just tell you how good our service is, we show you by offering a descriptive gutter guard installation YouTube video so you can get a feel for what we do and how our experience and knowledge can be put to work at your home. And if you want to install the gutter guards yourself, Hamilton Gutter Pros will provide you with complete gutter guard installation instructions so you can do the job as quickly and efficiently as possible. Don't let the seasons of bad weather leave you loathing them. You have more important things to do than to worry about checking your gutters to see how badly they need to be cleaned. Protect your home by installing gutter guards to keep trash and leaves out of your gutters, thus saving weight problems. Every homeowner cares about the condition of their home. That's why you put so much time and effort into protecting your investment. With a product like gutter guards installed by Hamilton Gutters, you will have one less thing to worry about off your maintenance list of things to do. Call Hamilton Gutter Pros to see how we can help you protect your most valuable investment, your home, from the ravages of bad weather. With gutter guards from Hamilton Gutter Pros, your gutters are covered.